It’s hard to be a Northern Spotted Owl, inhabiting old-growth forests in the Pacific Northwest. The logging industry has made your existence fraught, and it’s not like you’ve gotten much help from the powers that be. For the past 25 years, you’ve been listed as a Threatened species. Well, now we’re getting a better idea of exactly how hard it is. The Condor has just published research quantifying significant population declines in Washington, Oregon, and northern California. In some areas, the Northern Spotted Owl’s numbers have dipped by more than half during the past two decades, and other areas which maintained populations throughout the study period have recently experienced declines. The principal culprit appears to be competition with Barred Owls for space, food, and habitat. 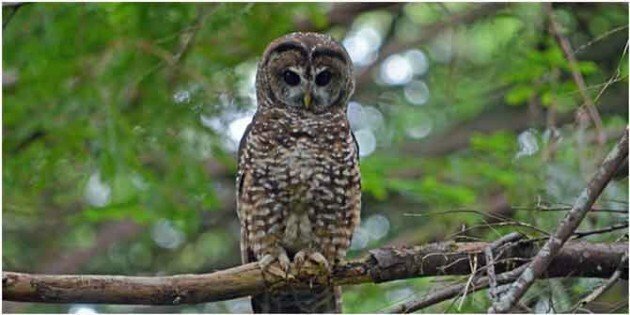 Areas which have removed Barred Owls have seen slower declines in Northern Spotted Owl populations, although further research about the effectiveness of this intervention is called for. Habitat loss and climate change (including an ever-increasing tendency toward warmer, wetter winters) also seem to play a part in reduction of Northern Spotted Owl numbers. Unfortunately, the authors concluded, all of these factors combined predict further population drops. So if you’re aiming to add a Northern Spotted Owl to your life list, you’re probably going to want to do that sometime soon—while you still can. Where Are You Birding This Second Weekend of December 2015? Bird Love Week Is Coming! But What Do Flamingos Mean?